In Thailand, the herbal compress is called luk pra kob, translated as “herbal pressing sphere.” To make the compress, a combination of healing herbs is bundled together in accordance with ancient recipes, steamed and placed directly on the skin to soothe muscular aches and swelling. 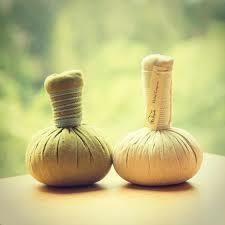 Thai Herbal Ball compress technique offers several potential health benefits: It induces deep relaxation, relieves stress and fatigue, boosts both emotional and physical well-being, assists alignment and postural integrity of the body, improves circulation of blood and lymph and stimulates the internal organs. The hot compresses are ideal for alleviating pain, stiff, sore or pulled muscles and ligaments, chronic back aches, arthritis, migraines and chronic stress or anxiety. The blend of traditional Thai herbs used in these compresses has a relaxing and invigorating effect on the body and mind, soothing sore and overworked muscles while giving the body's energy reserves a huge boost. The herbs in the compress possess properties that are anti-inflammatory, antiseptic, astringent and antioxidant. They are used to address sprains, bruises and sore muscles, cleanse and heal the skin by promoting cell growth, and aid upper respiratory ailments such as bronchitis, asthma, and the common cold.